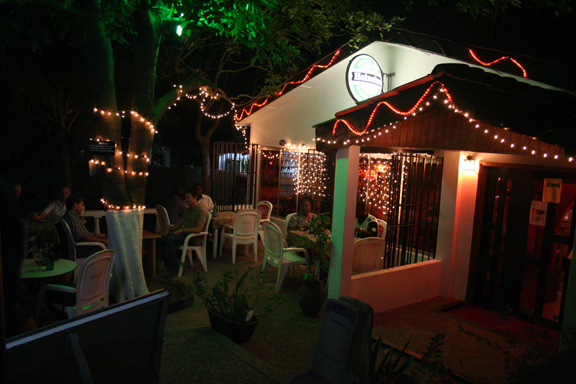 While in Accra, we went to Jazz Tones (not sure where it is in the city, but everyone knows it). It's a lovely hang out - essentially a jazz club that is also an extension of an African-American lady's living room. The bleach-blond woman in question sits at the back surfing via a huge old-skool 19 inch monitor. She swivels in her chair every now and again to survey all that is hers, then sometimes turns to face a mirror and apply a little make up. The band were pretty good, rolling through standards in a soft-bop type style. I took quite a few photos of them. The proprietor was somewhat discombombulated. She came up to me and asked me if I was a journalist. I told her I was a tourist. 'But its my band. Its my band!' she repeated with a Southern twang. I shrugged my shoulders and she went away. Our friends told us she is a little loopy. Near our table, a group of young students sat - Ghanaian students and white French boys. They laughed and chatted and took photos of one another. The whole table was at ease and full of excitement. Later, in the dappled coloured light of the porch, two of the French boys flirted with two of the girls as they smoked. All I could think was that such a gathering would never take place in Nigeria these days: young minds and bodies and energies circulating in a cultural exchange. How much more receptive Ghana is to outsiders. It all come down to perception! How many foreigners come to Nigeria with the intent to relax with the locals? All they have to do is relax with the locals once and learn never to do it again!